Another first class independent record tumbles out of Nashville and guess what…Neilson Hubbard is on top deck again guiding the talent. 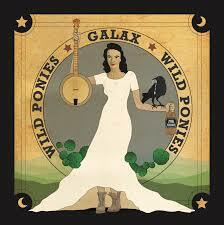 Without hesitation, Doug and Telisha Williams aka Wild Ponies will be first in the queue to praise the diverse team of accomplices who have conspired to create GALAX, surely one of the most heart rendering records to hit the shelves this year. This is explicitly the album that Doug and Telisha wanted to make. From start to finish, the listener is enfranchised to become part of a simpler and more basic world where values reign supreme over any agenda. Wherever you listen to this record, your mind and soul will be transported to a little place of timeless solitude in rural Virginia. A place where imperfections are re-configured to fuel what matters in life and music remains the voice of liberation. GALAX the record, houses ten varied tunes that encompass what is unequivocal about authentic country and rural roots folk music; Galax the location, is where these songs were initially recorded and the original home of Doug’s family. A recurring theme as the songs roll out. Just to put a few facts on the page, Nielson Hubbard took the ten tracks recorded in a disused farm that used to be the home of Doug’s grandparents back to Nashville to turn them into a practical shared format. Joining Doug and Telisha on this album were a mixture of fellow contemporary musicians from the Nashville community including Will Kimbrough, and a bunch of local players. These are folks who will continue to be keepers of the traditional music flame, in communities like this and likewise across the land. Gearbox Records is the ideal outlet to get the music issued to the wider world, with their recent back catalogue of releases including a similar sounding record by Applewood Road last year. In addition, the ten tracks were a carefully chosen selection of covers, new and older originals, plus a traditional fiddle-led tune, which launches the album in a manner that is retained for the forty-minute duration. There is extensive blurb online and within the liner notes documenting the background story to this record, but the true effect of any deemed commercial release is how this transpires to a listener not party to the recording process. On this account, the Wild Ponies need have no worries as its impact carries the intended weight. The clarity of the instrumentation stands out alongside the impromptu sound effects that breathe life into the project. You can take your pick for a favourite track, but if you are au fait with their latest album, there is a re-working of ‘Tower and the Wheel’, which also featured there. The song that jumped out to me from first listen and remains a key component as plays rally into double figures is ‘Jackknife’, a cover of a Jon Byrd song (not to be confused with Jonathan Byrd, familiar with many folks here in the UK). The track is so reminiscent of classic Kris Kristofferson and Telisha’s graceful vocals do the song justice. Like all records with longevity traits, each play reveals a little more about the song and that is certain to be the case with GALAX. Telisha once again hits the perfect note with a version of ‘Pretty Bird’ made famous by Hazel Dickens, while the idealistic sense of communal bliss perspires from the joint endeavours that go into the opening traditional tune ‘Sally Ann’. A song complete with toe tapping fiddle and the revelation of this being referred to locally as the 'national anthem' around these parts. You have to wait until the final stages before this record cracks the code of its source. ‘Goodnight Partner’ acts as the penultimate track and is a song credited to Doug’s family members. Like much of the album, Telisha makes use of her outstanding vocal ability to convey the conviction of a song to take lead, in what is quite a musically diverse piece, complete with pedal steel leading it off. This perfectly sets up a fitting finale with Doug taking up the reins to deliver a thoughtful ballad titled 'Here With Me' adapted from one of his grandfather’s poems. The crowning glory of a record soaked in a vintage tipple. Earlier in the album, further collaborations that are more contemporary spring up on the writing front. Fine writers in the guise of Amelia Curran, Ben Glover and Amelia White add their weight to ‘Hearts and Bones’, ‘Will They Still Know Me’ and ‘Mamma Bird’ respectively. The former lent heavily to the promotion aspect of the record via the featured video, but the tight containment of the songs meant any could quite conceivably have risen from the pack to spearhead the assault to drum up sales. The remaining track is quintessential Wild Ponies and it is fitting that ‘To My Grave’ is a pure co-write between Doug and Telisha. It could quite easily have been lifted from the record that pre-dated the name ‘Wild Ponies’ and captures the very essence of the sound that is perceived they set out to create. On last year’s Wild Ponies album, we were temporarily advised to ‘unplug the machine’. It appears Doug and Telisha have heeded their own advice, as far as you can go when making a record. GALAX scores highly in its intended aims and finding a fault remains a futile search in such a highly personalised piece of work. While the record is obviously steeped in the past, its ultimate appeal is how it illuminates the present. When both listener and artist enthuse on the same page, the job is done for now. Celebrating the frozen moment of the present is something we should never shy away from doing.